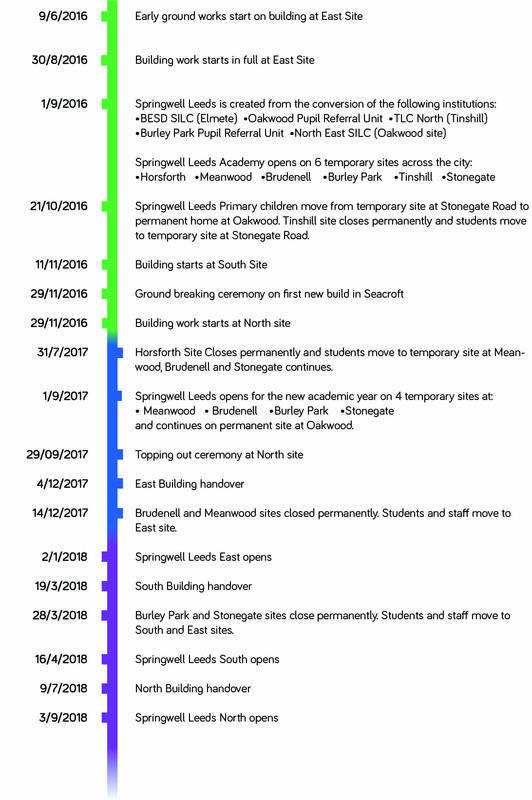 A brief history of Springwell Leeds Academy …. As part of a £45m investment from Leeds City Council, three new sites for Springwell Leeds Academy opened throughout 2018. These sites are situated across the city and provide state of the art facilities for our children and young people. We will eventually be an Academy for 340 5-16 year olds on four sites. In additon to the new builds, our Primary site at Oakwood, has been significantly refurbished and upgraded to provide a high quality specialist setting. Our students from Yr6, KS3 and KS4 are currently accommodated in the new build sites in the North, South and East of the city. Throughout the relatively short period for which it has existed, the development of Springwell Leeds Academy has been a continual process of change and growth. 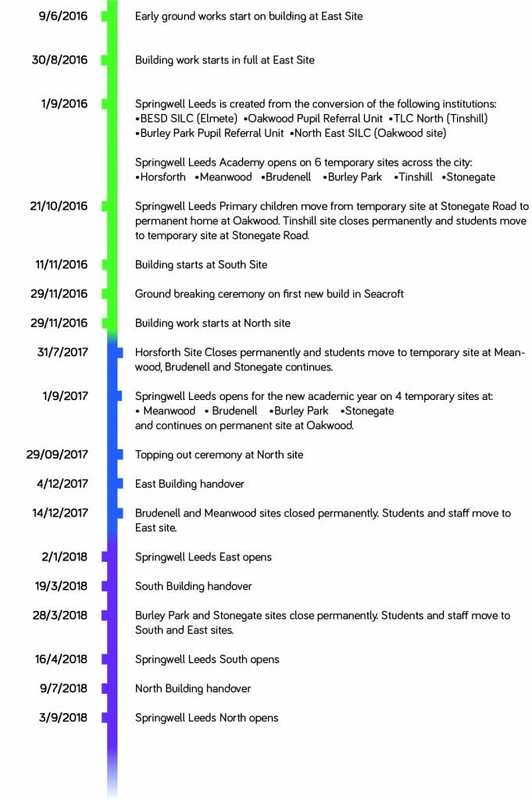 Below are some of the key events in the life of Springwell Leeds and some of the key statistics that illustrate this change and growth. Springwell Leeds Academy now caters for up to 340 students between the ages of 5 and 16, from across the city, with Social Emotional and Mental Health Needs. The Academy provides more than 200 jobs for staff working directly within the Academy and a further 30+ jobs through local contractors employed to provide services to Springwell Leeds.